In 2003 URBED together with King Sturge and TPP were appointed to work on a vision and development strategy for Inner Radcliffe. Radcliffe is a potentially very attractive market town in North Manchester. It sits in the dramatic valley of the Irwell and has a Metrolink Station which is only 15 minutes away from Manchester City Centre. The town centre is in a process of transition following the closure of its paper industry. The consultancy team looked at the regeneration of the core of the town and the development of underused peripheral sites. 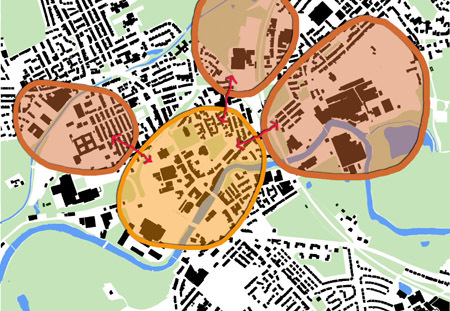 The URBED masterplan promotes six areas of change. These include the redevelopment of the two school sites and a preferred new school on the site of the former East Lancashire Paper Mill. The most important of the development areas is the SUN Quarter (Sustainable Urban Neighbourhood) which includes the town centre. Following the project the team was appointed to prepare a development brief for this site. 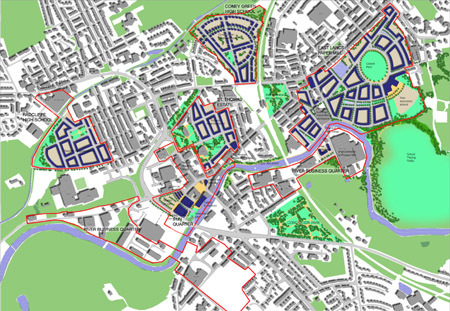 The Inner Radcliffe Vision and Development Strategy was adopted as a Material Planning Consideration in May 2004.